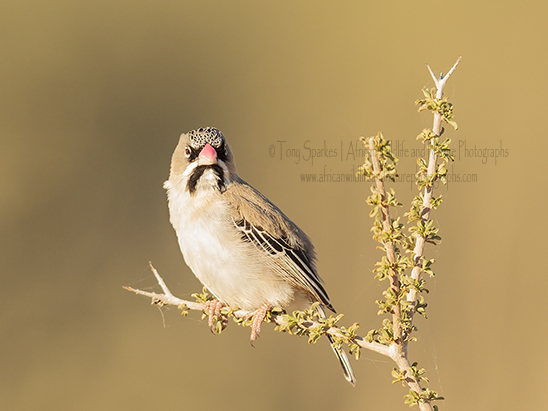 On our recent trip to South Africa’s Kgalagadi Transfrontier Park we came across in great numbers the small but delightful Scaly-feathered Finch (Sporopipes squamifrons) or as I like to call them which should become apparent to lovers of cricket and in particular Australian cricket the 'Merv Hughes' bird. We encountered this little bird in great numbers both by the waterholes, where they would ‘fly in’ sip water and fly back out to the nearest bush and in again, as well as perched on the flora and fauna along the sandy roads we drove. Its interesting to know that the Scaly-feathered Finch only drinks water when it is available and can last months without actually drinking, as it can produce what is called ‘metabolic water‘ from its diet of dry seeds and insects. This phenomenon clearly makes the Scaly-feathered Finch well adapted to the harshness of the more semi arid regions of South and Southern Africa like the Kgalagadi Transfrontier Park. Closely related to the sparrow and weaver families, the Scaly-feathered Finch is a small bird of some 10 cm (4 in) and weighs in at around 10 grams (0.35 oz) with a very distinctive small pink bill and broad black malar stripes, hence my ‘nickname’ for the Scaly-feathered Finch of the ‘Merv Hughes’ bird.